The black stones have the shape of a trapezium. If the marked stone were at a, the trapezium would become a bamboo joint, if it were at b, it would become a table shape, and if it were at c it would become a tippy table. 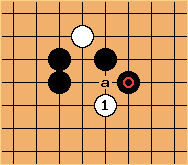 Usually, one sees the trapezium in amateur games as an attempt to connect and move faster. However, one rarely sees it in pro games and that because it is not such a good shape. Here are the weaknesses. Firstly, the diagonal in this shape can be compromised by . 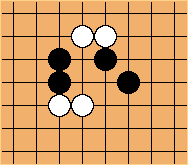 If Black next makes a bamboo joint at a, his marked stone becomes an empty triangle. Secondly, in this case the trapezium can be cut.Try to spot the weakness and verify at cutting the trapezium.